The creme de la creme of luxury stems. The Riedel Sommeliers wine glass line is the top-of-the-line series of stemware from the legendary Riedel. Wine experts agree that glassware makes a profound difference on how wines taste. Riedel Sommeliers wine glasses are the benchmark and the most successful series of hand-made glasses in the world. The wine glass bowls are mouth-blown into a mould, the stem and base are handcrafted using ancient glass-making methods. Recommend to hand wash. 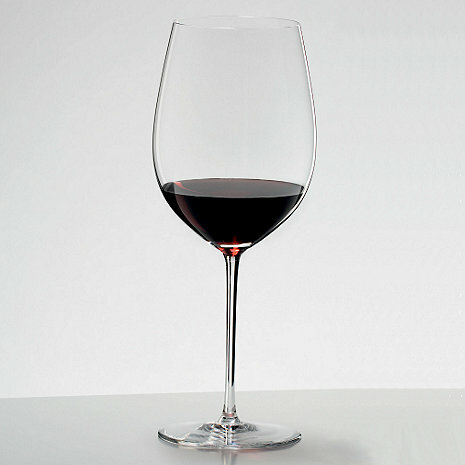 The Riedel Sommeliers Cabernet/Merlot/Bordeaux Wine Glass was developed to highlight the unique characteristics of great Bordeaux. The large bowl allows both young and more mature wines to breath, delivering a full spectrum of aromas and brings out the full depth of wines made from Cabernet Sauvignon, Merlot and Cabernet Franc. On the palate, the texture of the wine – soft, silky, velvety – is intensified and the finish prolonged, gently blending acidity with supple, sweet tannins. Size: 10-5/8"H x 3-1/8" Dia., 30-3/8 oz. I'm looking for a nice, light weight red wine glass shaped like the Riedel Sommeliers but shorter, like 8 1/4 to 8 1/2 T, 2 1/2 D. What do you suggest? BEST ANSWER: Thank you for your inquiry. For a shorter Riedel glass, I would try their classic Vinum line as they are 8 7/8" tall. If you have any further questions, pleae reach out to us directly at 800 356 8466. You can buy a "Riedel Sommeliers Cabernet/Merlot/Bordeaux Wine Glass" from http://www.wineenthusiast.com for $105.95. I have two very large glasses that I am assuming are the Riedel Sommelier glasses. They are much larger than the every day wine glasses. Can you tell me what they are called exactly? I want to order some for a wedding gift. Mine came in a black cylinder can with a pop off lid. They are great!! Perfect for special occasions! BEST ANSWER: According to your description, it sounds like you have the Riedel Sommelier glasses! Is this the same as the grand cru collection? BEST ANSWER: Yes- Riedel Sommelier Bordeaux Grand Cru - is the full definition. how tall is the stem of this glass? BEST ANSWER: It is one of the tallest I've used for wine. If you look at the second picture on the wine enthusiast site, it provides measurements. The picture shows that the stem is about 5 inches and the glass overall 10 inches. It is a BIG glass. A pair made a very nice housewarming gift for a wine loving family member. The Riedel Sommeliers Cabernet/Merlot/Bordeaux Wine Glass (1) stem is 4 3/4 inches in length. The closest glass we have i think would be the Zinfandel which is just under 9" tall. Wine Cellar Specialists a call to discuss @ 1-800-356-8466. Jim. The sommelier glasses I have are about 10 or so inches tall. These are very grand glasses and my personal favorites for red wine- both Cabernet and merlot. They look lovely on my dinner table. I shopped for height. Beautiful glasses. Great glasses for wine enthusiasts! I bought these glasses for my husband's birthday. He likes more expensive wine so I figured these glasses would be worth the money. They are very stylish and provide an excellent glass for the wines. They are obviously fragile but we haven't had any issues with them cracking or breaking - we just wash them by hand carefully. Overall a great quality product! there should be a return policy for broken glasses. One was my fault. The other class literally broke in my hand. I think the stem is too thin for the size of the bowl. Best glasses available for big cabs and Bordeaux. But handle with care: even with careful hand washing you may shatter the thin crystal. Two of the glasses arrived shattered in the box. A quick e-mail to customer service and they were promptly replaced no questions asked. A great glass for special occasions. Don't let anyone else wash it...too delicate & expensive to replace. Although fragile and delicate to clean.....this is the only glass to drink wine from. The Somellier Series from Reidel is the ultimate in wine enjoyment. Why pay for expensive wine and then drink it from a glass which is less than perfection. Expensive but well worth it. It took several tries to get this delicate stemware delivered intact. Customer service was exceedingly helpful in seeing that replacement glasses were sent in a timely fashion. Needless to say, buy from a reputable source when purchasing high-end stemware. The glasses are great, but almost more exciting are the canisters in which each individual glass is shipped. Totally elevates the dining experience. Our senses are awakened when the Sommeliers are on the table. Definitely enhances the red wine experience. However, you have to be extremely careful when washing because of the large, delicate bowl of the glass. These are very beautiful glasses ... and very delicate. This recent purchase was to replace a glass that we broke. If you have a top of the line product it should be top of the line and without defect, even mouth blown products!!! These glasses at over [$] a pop should have been weeded out of the sommeliers collection as they were poorly finished on the stems and had visible airbubbles in the bowl!!! I would like to return them but the hassle of packing and shipping such fragile stems is more daunting than I care to think about. They were a gift and I was embarrassed when I used them with my husband! I have several other types of this glass and none of them came in such poor shape, what a bummer! This is a beautiful glass, but the very first time I washed it ( by hand, very gently, with a special wine glass washer sponge) it exploded in my hands! It was so thin and fragile it was virtually impossible to wash, and a one time use is too costly for me! We are going to return the unopened ones and replace them with the next level of glasses, which we have had for many years and love. After doing several wine tastings with George Riedel, we became avid about the need for the right glass for the right wine. This is the perfect glass for red wine enthusiasts! These are great glasses for bordeaux type wines, but they are extemely delicate and must be handled with care. Although a bit pricy, these glasses can take your best wines and transform them. Opens them up for breathing, allows for the aromas to disperse and makes for an extremely pleasant drink. Prompt delivery. Durable storage container. great to use when I feel like indulging myself and makes a real difference in how a wine tastes; unbelievable to say the least; really worth the price. can fit my entire hand into the bowl for careful cleaning and drying. very easy and have never broken one while cleaning...have broken two of my 18 by accidentially knocking it off the counter to the floor. guess i enjoyed it too much on those rare occasions. It was a X-mas present for my son. The original glass broke and i had to hurry up and get him another. The best glass in the world. This glass is perfect for enjoying fine wine. It is the only glass i'll ever use to drink my big cabs & bordeauxs in the future. The only drawback is what makes it great. It is so thin and hard to clean. i recommend buying a few extra because you will break one. This is the perfect glass for Merlot or Cabernet. This glass brings out the best in wine. Be careful washing this glass as I broke it doing same. The glass allows the wine to become its best. You'll never want to use another glass! This glass is exceptional. I have experienced a new level of enjoyment for my red wines. The glasses are expensive, but you will ABSOLUTELY notice a distinct difference that makes them worth it. I saw much discussion in the reviews about cleaning, but with reasonable caution, they are easy to clean by hand. Bowls are large enough to fit my whole hand and wrist. Haven't had any problems. Outstanding product that contains one of life's best drinks! Fabulous piece for anyone. I collect one stem at a time and have enjoyed growing the collection. Recommend purchasing the wine glass cleaning brush because it is so delicate. Enjoy! Extreamly fragile - broke a glass the 1st time I used it.. Boy these are beautiful glasses with a nice big bowl. However, they are very very thin and a bit scary. This glass is big and very delicate! However it treats an expensive or old bottle of wine excellently! I would use another glass for everyday but this is perfect for a good bottle of wine. Washing the glass requires patience and alittle skill because of its size! The glass is delicate but worthy of bringing out the delicate tastes in your favorite merlot. Stylish yet practical and a must for your dinner party. Pricey but worth the money. Its a wonderful cup and wine really tasted different. It is very delicate so you have to be very careful when washing it. Lovely and maximum enjoyment of wine but VERY FRAGILE. Every single one broken before 9 months even with the most diligent of care. Would recommend with the foreknowledge of spending alot because the glassware will have to replaced constantly.